X-Large - $64.99 Only 3 left! Grizz is not your average bear! He's anything but your typical grizzly. He doesn't spend all of his free time foraging in the forest looking for food. He has a refrigerator for that. His favorite food isn't salmon. He's really more of a burrito kind of bear. He's officially banned from a certain froyo shop in his area. He can even ride a bicycle with ease and he's also quite talented at playing the harmonica. He's really nothing like all those bears that you see tromping around through the woods in those nature shows! Of course, you're no average human either, now are you? 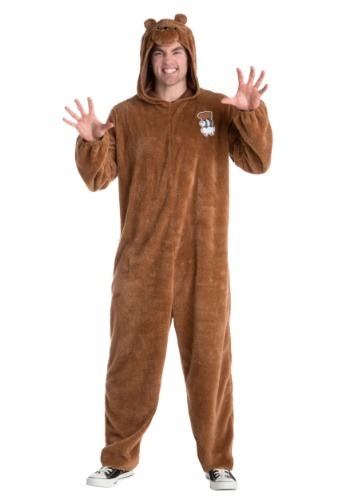 If you're going to dress up like a grizzly bear this Halloween, you don't want to just dress up like some kind of normal bear, do you? No! You must dress up like Grizz, the most extraordinary bear from the show, We Bare Bears. This officially licensed Grizz costume helps you transform into your favorite grizzly bear from the hit cartoon series! It comes with a full jumpsuit that is covered in brown faux fur. The "Bear Stack" emblem is embroidered onto the front, which has Grizz, Ice Bear, and Panda Bear all stacked up together! The hood is shaped like a bear face and it even has a plush nose and little round ears on top. It fits easily over your normal clothes, so transforming into Grizz is a complete breeze!